ORLANDO, Florida (Reuters) - George Zimmerman was stopped for speeding this week for the second time since he was acquitted of murder in July for shooting unarmed teenager Trayvon Martin, Florida police said on Wednesday. "Sorry," Zimmerman told the officer who was wearing a body camera. The video was posted on Orlando NBC-affiliate WESH-TV. Zimmerman was stopped and ticketed on Tuesday in the town of Lake Mary for driving 60 miles per hour in a 45 mph zone, Lake Mary police officer Zach Hudson said. The ticket carried a $256 fine and three violation points against his driver's license. In Florida, 12 points results in a license suspension, and any number of points can affect auto insurance rates. Hudson said Zimmerman's behavior toward the officer was "very appropriate." He said Zimmerman can pay the fine, contest the ticket, or attend a driver improvement class which can void the points, lower his fine and block an insurance rate hike. Zimmerman previously was stopped on suspicion of speeding in northern Texas two weeks after his acquittal, and was let off with a warning to slow down. He has a concealed weapon permit and told the Texas officer that he was carrying a gun in the glove compartment. Hudson said Zimmerman made no mention of carrying a concealed weapon in Florida. On video, he can be heard asking the Lake Mary officer for permission to get his registration and insurance card out of the glove compartment. Zimmerman was a neighborhood watch captain in a gated community in nearby Sanford when he fatally shot Martin who was en route to a townhome after a trip to the convenience store to buy snacks. 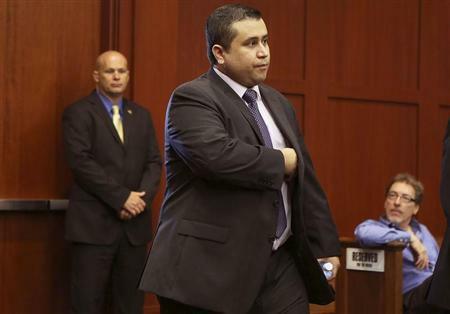 Prosecutors argued that Zimmerman profiled, pursued and confronted the black youth. Zimmerman claimed he shot Martin in self defense.